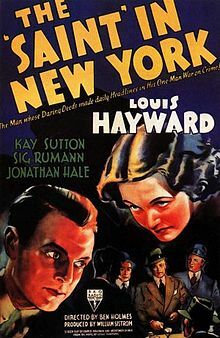 First cinematic adaption of the Leslie Charteris character stars Louis Hayward as Simon Templar a notorious villain according to the police who only seems to target bad guys. Here the desperate New York City police make a deal with Templar to have him try and topple a gang of bad guys who are running roughshod over the city. Bleak dark and and the sort of thing I thought the production code stoped Templar is a kind of urbane Punisher killing anyone who displeases him. Utterly fearless, his bravado terrifies the villains because he simply isn't scared of them. His only weakness is bombshell Fay Edwards (Kay Sutton) who has her own code to follow. Hayward makes a striking Saint. Easily handling the the tough stuff with the witty reparte. He's more a modern man of action than one from the golden age of Hollywood- but with a coldness that is chilling. He really will kill anyone. Seeing the film for the first time in a couple of years I realize its the coldness that keeps this from being a great film. Templar is someone you admire more than like which is a reason they changed things up when the film went to series. A solid film, this is recommended as the sort of film they rarely ever made and the start of a great series.